The two couples have a battle of wills at the company function when they meet. As the fates are smiling on Deok-In during this subarc, she finds that all of the family members support her and Jinwoo. Things are less smooth with Deok-In’s mother who becomes disappointed when she finds out that Deok-In’s husband’s family is not what she had imagined. Finally, Eunseo finds out the truth. The father-in-law smiles that Deok-In looks nice and the mother-in-law agrees. True to his words, Jin-Myung purposefully walks over and welcomes Deok-In. To Jinhee’s fury, Jin-Myung brings Deok-In over to meet all of the other members. As soon as Deok-In introduces herself, the father-in-law comments that she looks like a member of the family already. Everyone looks awkward and the mother-in-law does what she does best. She asks Eunseo to take Hong-Ran away…but not before Hong-Ran pauses to ask Deok-In if she likes her…since once Deok-In joins the family, Hong-Ran would higher on the family tree. Looks to me like a cat with a mouse actually, not like Hong-Ran has any ill feelings just that she enjoys being able to throw everyone off their guard… something not easily done with the current family members. Hong-Ran then turns to ask Jinhee why she’s not introducing herself when it’s the first meeting. All four of the involved parties look awkward and then Jinhee grits her teeth…She stutters that it’s a pleasure to meet Deok-In. Hong-Ran smiles widely and then asks Kyung-Cheol to introduce himself as well. Jin-Myung tries to pull Hong-Ran away but she insists on staying. Kyung-Cheol pauses but manages to say that it’s good to meet Deok-In…He bows his head and Deok-In quietly begins to bow her head in response. Before Deok-In manages a full bow, the father-in-law pulls Deok-In away, implying that Kyung-Cheol is not important enough to get introduced to. When the father-in-law pulls Deok-In away, the rest of the family also disperses to go about their business and network. The father-in-law brings Deok-In to a table with drinks and asks if this is the first time that Deok-In is at a function like this. Deok-In confirms and the father-in-law tells Deok-In that it’s not difficult. He gives her advice that she should just carry a glass of alcohol and walk around; when she gets tired, she can sit. He also scolds Jinwoo for not taking better care of Deok-In and Jinwoo ruefully answers that the father-in-law did not give his son a chance. Smiling, the father-in-law tells them that he has other business to attend to and leaves them alone. Deok-In whispers to Jinwoo that she feels like she’s come into a zoo with everyone staring. Jinwoo whispers back that she’s more like a cute hamster with her large eyes darting from one side to another. Deok-In snaps back playfully that Jinwoo is comparing her to a rat and Jinwoo laughs. Eunseo brings over the two youngsters and introduces them as her son and his cousin. Deok-In comments that Minseo looks very similar to Yunseo. Eunseo smiles and asks Jinwoo as his mother is looking for him. She also excuses herself and promises to speak with her further at another time. Jinhee comes and snipes that Deok-In has pushed her to the end. Deok-In answers back that this is not the place to hold this conversation. True to Deok-In’s words, Hong-Ran comes over as Jinhee is about to stalk off. She tells Jinhee to stop glaring because someone could mistake it for Jinhee wanting to fight someone. Jinhee ignores her and continues walking back to Kyung-Cheol as Hong-Ran smiles to Deok-In. She comments that Deok-In looks prettier than Jinhee and gets an exclamation of shock from Jinhee who was still in hearing distance. Deok-In cautiously asks her if Hong-Ran knows about their relationship. Hong-Ran almost licks her lips in satisfaction and asks how Deok-In realized. Deok-In answers that she used to be a detective getting Hong-Ran to say that she approves. She also asks Deok-In knowingly why Deok-In did not beat up that man “over there,” looking over at Kyung-Cheol and winking at Deok-In. Suddenly, Jinwoo enters her vision and looks at Deok-In. He follows her gaze to Kyung-Cheol and walks to Deok-In’s side where he puts his arm around her and guides her away. Satisfyingly, Kyung-Cheol face contorts and even unconsciously takes a step when Jinwoo leads Deok-In away by her shoulders. Once they have some space, Deok-In asks if the family members know about the relationship between the four people. Jinwoo answers that his parents do not know. Getting defensive, Deok-In asks why he did not tell her…it makes her the center of all of the jokes. Jinwoo tells her that she should not worry as she shines brighter than anyone else. He feels like he’s just reaffirmed how much he loves her. Kyung-Cheol spies angrily as Jin-Myung walks over to give his words of support. He tells Deok-In that it is probably exhausting at first since it feels like everyone is watching you. He tells her that it will get better. Then Jin-Myung tells Deok-In that the siblings know about the situation and he hopes for the best for them. He explains that his little brother is like a “brother like tears” for him as his little brother has shouldered Jin-Myung’s own burdens. After making it clear that he’s on Jinwoo’s and Deok-In’s side, he leaves. Deok-In goes to the bathroom to freshen up with renewed confidence. As she walks out, she runs into Kyung-Cheol who pulls her aside forcefully and yells at her to go back to the restaurant where she belongs in front of the sink. He adds that she looks the most cheap and out of place so she should leave before she makes an even bigger fool out of herself. Deok-In keeps her chin up and glares back at Kyung-Cheol. Looking him straight in the eyes, she tells him that Jinwoo told her that she shines the brightest so she does not need to leave. Kyung-Cheol sneers that Deok-In has some nerve frolicking in front of her husband. Tears start to fill Deok-In’s eyes. Jinwoo walks by at that moment and yells out that he’s been looking for Deok-In. Ignoring Kyung-Cheol, he puts a protective arm around Deok-In and leads her away. After the party, the family arrives back at home in high spirits. The father-in-law announces that he really approved of Deok-In. The mother-in-law cautions her husband before making any conclusions since he has only met Deok-In. The father-in-law lightly answers back that he knows his wife approved as well from her expression. She sighs that Deok-In looked like she would be patient which is necessary for a successful marriage…while, looking at Hong-Ran. Hong-Ran pretends to be confused and shocked. She asks her mother-in-law why she would look at her since she’s one of the most patient people in the world. The mother-in-law sighs and tells her to change. Hong-Ran laughs that she had so much fun today only to get snapped at that the party was not thrown for her entertainment. The father-in-law has to comment that his wife seems to be especially hard on Hong-Ran today when Hong-Ran did not make any mistakes for once. The mother-in-law responds that they don’t know what Hong-Ran outside of their view and Hong-Ran laughs that her in-laws are so funny. Once in her room, she laughs about how fun the party was. Then she sighs that Deok-In seems like a formidable opponent. She then laughs about how her father-in-law took Deok-In away before she could accept Kyung-Cheol’s greeting. She notes how she thinks Jinwoo and Deok-In has already won. Jin-Myung agrees that Deok-In had an energetic human atmosphere about her. Hong-Ran agrees whole-heartedly whining that the family needs that as she feels suffocated. Jin-Myung asks her why she had been so combative at the event if she approved of Deok-In so much. Hong-Ran just answers flippantly that it was fun. Then she literally deflates as she sighs that now that the party is over, she feels empty and lonely. She walks over to the closet to change into her pajamas wondering why she feels so empty. Watching her figure, Jin-Myung looks started to see her so vulnerable all of a sudden. He finds himself telling her that he’s going to sleep in the room tonight as his back hurts from sleeping on the couch every night. Hearing this, Hong-Ran lights up and bounces back over excitedly like a kid! While Jin-Myung has promised to sleep in the bedroom that night, he still goes to speak with Eunseo over tea. She comments happily how everyone seems so energized by the thought of Deok-In joining and decides that their family needs a person like this…For the first time during this drama, we hear about Jinwoo’s ex-wife as Eunseo sighs that she had been a much quieter person that made Jinwoo feel lonely. Jin-Myung agrees that it is the lonely people who make other people feel so lonely…He then tells her almost as if confessing that he had been surprised himself. Hong-Ran had flounced around at the function making trouble but deflated so quickly at home, he felt worried about her. Eunseo laughs when she hears this. She comments that no matter how much people talk about whether or not a couple matches each other, you still fall in love with each other once married. Sheepishly, Jin-Myung wonders what being a married couple means. He apologizes for not being able to comfort Eunseo more. At the same time, Hasoon goes to her friend’s shop and asks for $300. She promises to pay her back as soon as she gets paid. With the borrowed money, Hasoon takes Deok-In shopping. She pulls her over to one store and stops in front of a white dress. Deok-In tells her that she does not need anything. However, Hasoon explains that she always regretted not buying Deok-In an outfit sooner when Deok-In was a child. Deok-In continues to refuse the gift until her mother asks if it is because Deok-In is embarrassed to be with her in the mall. Deok-In relents and tries on the dress. She looks pretty in the dress and the employee comments on it. She uses her borrowed money to pay for the dress and they go take a family picture. The photographer encourages them to look friendlier and Deok-In shyly takes her mother’s hand. Hasoon nervously sits for a minute before grabbing Deok-In’s arm. Deok-In asks how Hasoon could give her baby away for adoption when she worried about even the baby’s haircount. Hasoon sighs that living wasn’t living. They end up waiting for the bus together because Hasoon continues to insist that she lives in the neighborhood. She also takes the opportunity to give Deok-In her baby pictures noting that she doesn’t know when she will see Deok-In again. When the bus approaches, Hasoon continues to sit saying that she will take the next bus. Seeing through her mother’s loneliness, Deok-In tells her to go ahead as she will call Hasoon again. The reassurance calms Hasoon and she runs to catch the bus… Until she boards and excitedly knocks at the window until the bus fully pulls away. Deok-In gets in the mood and cooks noodles for Jinwoo. She smiles that her mother is bright even though her hardships, which reassures her. Jinwoo tells her that he wants to meet Deok-In’s mother as well. Deok-In laughs that he would never have met someone like her before. Jinwoo laughs that as a teacher, he’s met a lot of different people and will wait until Deok-In feels comfortable introducing her mother to him. At the same time, Hasoon sees some customers leave the rest of their soju in the bottle. She considers it for a moment and then pours the rest into a bowl surprising the owner. Hasoon asks the owner what his son-in-law does. The owner answers that he is a manager in a big corporation. Hasoon smiles that a manager is just a salary man and hums to herself thinking of Deok-In and her accountant husband. Kyung-Tae seems to have some second thoughts has he continues to try to call Hyojung who ignores his calls. Meanwhile, at home, Deok-In looks at her baby pictures happily until Bok-Rye comes in. Bok-Rye asks her if something happened as Deok-In seems different going out a lot and even wearing makeup. Deok-In tells her that she found her mother and Bok-Rye happily congratulates her. She pats Deok-In on the shoulder telling her that it’s great news. She goes out into the living room to worry with Kyung-Soo about Deok-In finding her mother. She tells him that while it’s good news, with Kyung-Cheol living with the other girl, any mother would be furious. After worrying about it, she goes to Deok-In to invite Hasoon over to meet. She tells Deok-In that they can invite Kyung-Cheol over for one night and pretend since her mother has to be curious. Though surprised, Deok-In accepts! The next day, Deok-In goes back to the restaurant and asks her mother over for dinner. Hasoon wavers as she worries that she might embarrass Deok-In but, in the end, she agrees. Bok-Rye calls Kyung-Cheol over to tell him the same thing. Kyung-Cheol seems surprised but doesn’t promise that he will come. Hasoon comes home with Deok-In but gets disappointed even before they enter the house because the neighborhood is more run down than she expected. Once she enters the house, Bok-Rye happily greets Hasoon who scopes out the house and seems off-put by Kyung-Ah’s condition. She sulkingly asks where Kyung-Cheol is and Bok-Rye answers that Kyung-Cheol is running late. Hasoon mutters that Bok-Rye’s husband lacks manners since he should have arrived before his mother-in-law and the mood tenses. Deok-In pulls her mother into her room to demand to know why Hasoon is acting so rudely. Hasoon just snaps back that the two brothers-in-law look like the guys in her neighborhood and now she knows why Deok-In lives in such a run-down house even though her husband is an accountant…the whole family lives off of Kyung-Cheol’s success. At the same time, Kyung-Ah cautiously asks her mom if Deok-In’s mother seems disappointed. Bok-Rye snaps back in her mind that Hasoon is more pitiful if she had to give up her own child but holds her tongue. Deok-In comes out to apologize to Bok-Rye for her mother’s behavior. Bok-Rye replies that nothing is wrong but she mutters it and it’s clear that she does not mean it. The Kang family also has dinner. The father-in-law tells the adults after that CEO Hong asked him about whether or not they are going to groom Minseo as the heir to company because CEO Hong’s granddaughter seems to be interested in Minseo. 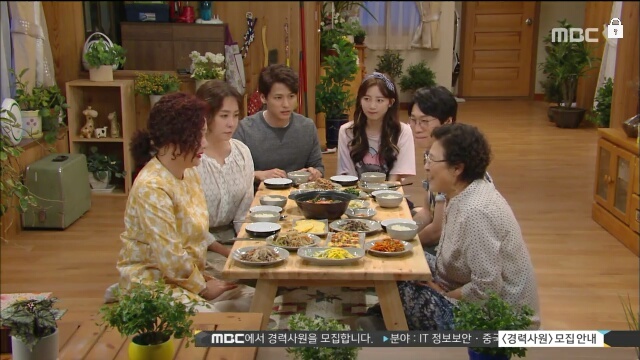 The father-in-law tells the family that he had answered that he needs to talk to the kids first…He asks Jin-Myung if he wants to choose Minseo as the heir now; they cannot back out once they agree to an engagement. Jin-Myung tells his father to tell CEO Hong that they will think about the engagement after the children graduate from college. His father tells him that the answer will not work since it’s basically the same thing as a refusal… They need to clearly says yes or no to the engagement of CEO Hong’s granddaughter and Minseo. The father-in-law then turns to Eunseo to ask what she thinks. She answers with a question about whether her answer is important. The father-in-law tells her that he will think of her answer as her dead fiance’s answer…Eunseo tells him that she will need four days to think about it and he agrees. At Deok-In’s house, Hasoon continues to show her dissatisfaction at the fact that Kyung-Cheol never came home to meet his mother-in-law. She sneers that Kyung-Cheol needs to learn manners before starting to slurp down her noodles making Deok-In uncomfortable. Meanwhile, Eunseo demands to know if this is what Hyunseo wants…to give up being heir to the company and to marry Hyojung who is a normal girl while Minseo can marry the granddaughter of a larger company. Hyunseo tells his mother to give up and let him find his happiness. She gets up without a word and goes to brood in her room. After sitting alone with her thoughts and tears, she asks Jin-Myung for a chat over tea. She asks Jin-Myung directly if she can meet the friend that had been on the boat with Jin-Myung and Jinwoo the night that her fiance had died. She gets up to go after Jin-Myung but runs into Hong-Ran, whom she asks to speak with in the kitchen. Once Hong-Ran is sitting, Eunseo tells Hong-Ran that Jin-Myung told her everything. Without thinking about it, Hong-Ran falls for the bait and asks if Jin-Myung actually told Eunseo that he did not save his older brother when he had the chance. Eunseo gasps for breath silently as the tears flow up. She looks at Hong-Ran’s matter-of-fact face in shock and then runs out of the kitchen…straight into Jin-Myung. She demands that they talk and when Hong-Ran realizes that Eunseo had played her, she tries to stop the two but it’s too late. Eunseo quietly shrieks at Hong-Ran to stay out of the matter as she takes Jin-Myung into the study. There, she asks him how he could have let his brother die without saving him. Jin-Myung’s character is difficult to analyze. He does not appear to be a selfless man. While, the normal materialistic goals do not motivate him, Jin-Myung is a strategic player. He had told Jinhee that he supports her desire to focus on love. Yet, when Jinwoo tells him that he loves the wife of Jinhee’s boyfriend, Jin-Myung switches alliances without a thought. His only explanation is that Jinwoo has shouldered “his burden.” I’m cautious to say that Jin-Myung believes that Jinwoo would be happier with Deok-In than Jinhee would be with Kyung-Cheol. Rather, it appears that Jin-Myung feels guilty to Jinwoo who kept his secret all of those years. The dynamic between the two in-laws is also interesting. Both sides are obviously at a social disadvantage. While, Hasoon’s character is obviously meant to be extremely rude and tactless, I find that I think Bok-Rye’s family deserves some of her behavior… Objectively speaking, any normal family would not even be polite to Kyung-Cheol’s family in this kind of situation. Only because Deok-In’s mother had not been around can Bok-Rye’s family even think about living off of the generosity of a daughter-in-law who supported the whole family until the son goes off an has an affair. If Kyung-Cheol actually brought this divorce to the Korean courts, even the patriarchal Korean courts would find Kyung-Cheol to be at fault. (Assuming that Jinhee’s parents are not rich enough to pay off/influence the judges…) As rude as Hasoon is portrayed to be, I think she’s not saying enough.